In the wilds of Canada circa 1815, sisters, Bridgette (Emily Perkins) and Ginger (Katharine Isabelle) are lost in the woods. They encounter a strange old woman who tells them they must kill a boy or one sister will kill the other. Ginger is wounded by a trap, and the girls are rescued by a hunter who brings them to a nearby fort. Ginger discovers a strange feral boy who is locked away. He bites her hand. As a series of secrets and deals swirl inside of the fort, giant wolves begin besieging the outside. 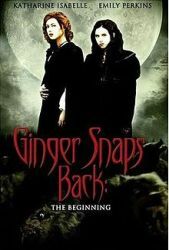 With Ginger Snaps (2000) being such a monumental success, and Ginger Snaps II: Unleashed (2004) being a bit of a disappointment, Ginger Snaps Back seems to get forgotten. It’s definitely not as good as the first film. It lacks the subtext and wit of its predecessor, but it does have a good story and a unique setting. I am a little less convinced at the attempts to tie this film into the events of the first, it really wasn’t necessary and doesn’t make a whole lot of sense anyway. Emily Perkins and Katharine Isabelle are a great duo, I would love to see them work together more often. The movie makes great use of the cold and isolation. Some of the werewolf effects aren't as successful as they could be, but they are used sparingly enough that isn’t a huge issue. Ginger Snaps Back is a minor gem that hopefully gets a little more recognition in the future.